Posted in Uncategorized on September 21, 2018 by Shelby Aaberg. Posted in Math Contest Problems, NATM: Nebraska Association of Teachers of Mathematics, STEM, Teacher Resources, Teacher Think-Alouds, Uncategorized on September 9, 2016 by Shelby Aaberg. Here is the folder containing the PowerPoint for the talk I will be giving in Toulouse, France at the International School of Toulouse. Posted in Uncategorized on October 14, 2015 by Shelby Aaberg. Posted in Collaboration by Teachers, STEM, Technology on September 14, 2015 by Shelby Aaberg. Let me know if you need anything else from the conference! Thanks again! Posted in Desmos, Geogebra on September 14, 2015 by Shelby Aaberg. Establishing community in the classroom can be a challenge. Here's an activity my students participated in on the first day of school. I learned about this activity while participating in the Advanced Educator International Space Camp in Huntsville, Alabama. The objective is for two crews of astronauts to exchange positions in cramped quarters when a new crew shows up to relieve the old crew at the International Space Station. Only one person can move at a time. Only movement forward (in the direction a person faces) is allowed. 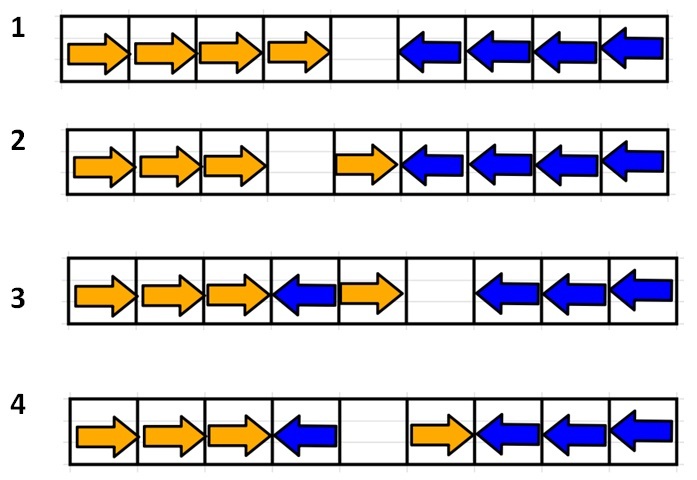 In the above diagram, orange players can only move right, while blue players can only move left. A person can move to an empty space in front of them. A person can jump an opposing team member in front of them. What Does It Mean to Win the Game? The teams win the challenge when they have exchanged their original positions. See the ending position diagram for an example of what this looks like. 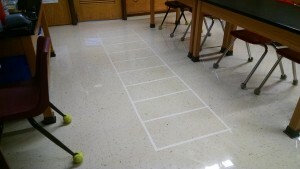 A teacher could use an agility (speed) ladder for this activit y. Or if a ladder isn't handy, use tape. This is a shot of my classroom the first day. It's pretty unlikely a teacher would have only eight students. I put down three tape ladders in my classroom on the floor. If the number of students is not a multiple of eight (like my class was), the teacher could place the extra students on the side as coaches. To up the responsibility of the coach, add the rule that no one inside the ladder can talk to anyone else. While this activity was going on, I floated between the groups and listened very carefully. I wanted to learn about which of my students would step up and take initiative; which would be a leader; which would be concerned about the frustration of others and take action to minimize other students' discomfort/anxiety. This activity helped me better understand how to assign groups for course work in a meaningful way. Below is an example of what some students might do. If the third blue player from the right jumps the lone orange player, the blue team has a problem. With two blue players in adjacent cells, the game is gridlocked and ends. Once the students came up with the solution, I gave them the sequence "1-2-3-4-4-3-2-1" and asked them how it relates to this situation. Think of this sequence as the answer key. Ask the students to come up with some pseudo-code to describe how they would build this game on a computer using programming applications. Ask the students whether the strategy remains the same if there are teams of five? Or if there are two empty middle squares? Three empty middle squares? Ask the students to write a program that allows the user to watch the game. Then ask the students to write a program that allows the user to play the game. 1 2 3 4 _ 5 6 7 8. 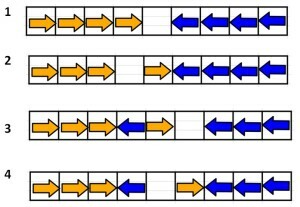 Then, each move would be a shuffling of the sequence. The second row would be 1 2 3 _ 4 5 6 7 8. The third row would be 1 2 3 5 4 _ 6 7 8. The fourth row would be 1 2 3 5 _ 4 6 7 8. We had a really spirited discussion of the issues that could arise from each organizational coding strategy. Posted in Classroom Management, Games, Instructional Strategies, STEM, Teacher Resources, Uncategorized on August 24, 2015 by Shelby Aaberg. 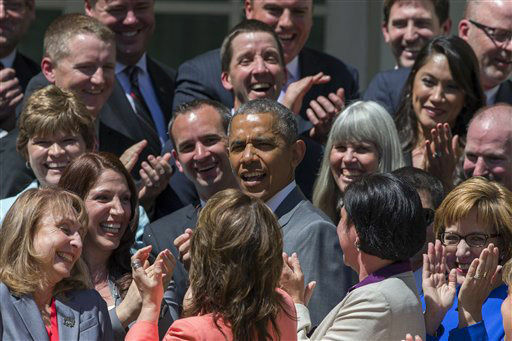 Below is a photo from our photo session with President Obama on Friday 7/31. I am on the far left! Posted in Uncategorized on August 2, 2015 by Shelby Aaberg. 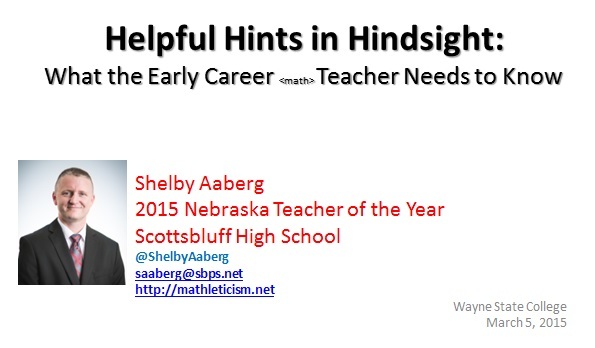 Posted in Collaboration by Teachers, Instructional Strategies, Professional Development on June 3, 2015 by Shelby Aaberg. I Shook President Obama’s Hand Twice! 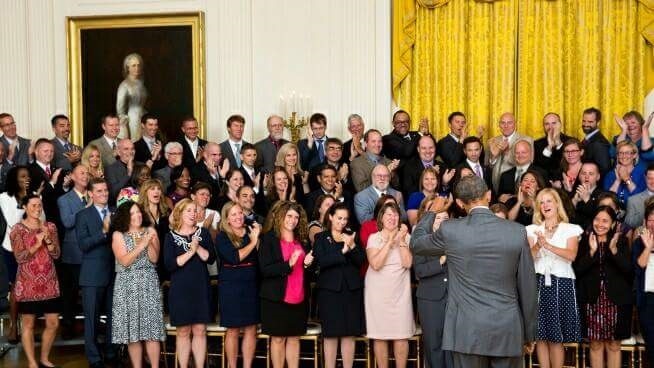 Below are two photos from the National Teacher of the Year recognition event held in the White House Rose Garden on Wednesday, April 29, 2015. Posted in Collaboration by Teachers, Inspiration, Professional Development, STEM, Uncategorized on May 3, 2015 by Shelby Aaberg. Click on the link below to view the presentation I am giving at Wayne State College later today. Posted in Collaboration by Teachers, Ideas, Instructional Strategies, Pre-Service Math Teacher Tips and Tricks, Professional Development, STEM, Teacher Resources, Teacher Think-Alouds, Technology on March 5, 2015 by Shelby Aaberg.